What a delicious time we’ve had on our visit to Savannah! Gathering with friends for brunch, after church, on Sunday, is a time-honored tradition. We couldn’t think of a better place to keep that tradition alive than at Gryphon, the 11th installment of Peaches on the Road. The past three weeks’ blog posts have taken you on the road to Savannah with us. The itinerary continues this week. We’re making it easy for you to plan your next trip. Sunday Midday. 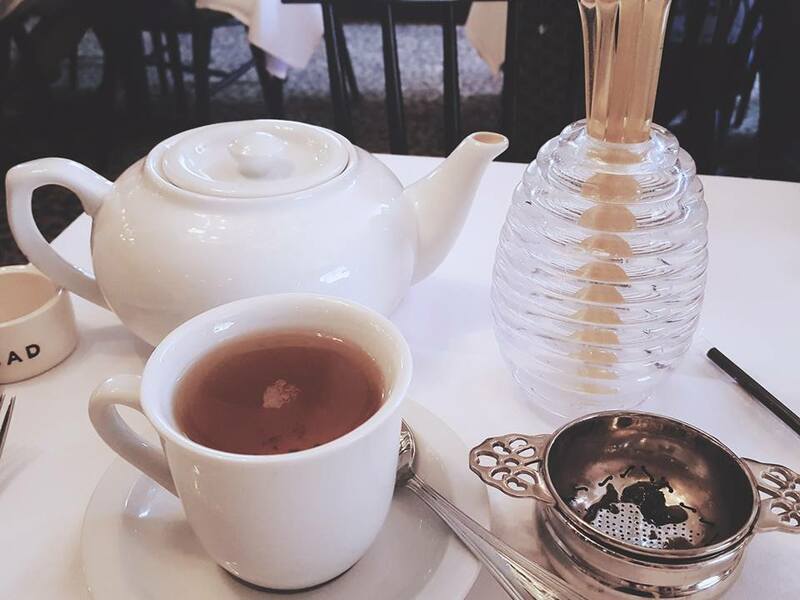 Head to Gryphon, for brunch or a proper English tea. Located in the ornate 1926 Scottish Rite building, Gryphon is perfectly situated on Madison Square, at the corner of Bull and Charlton Streets. Enter this intimate, gracious, yet unpretentious restaurant and take a moment to soak in the elegant decor. 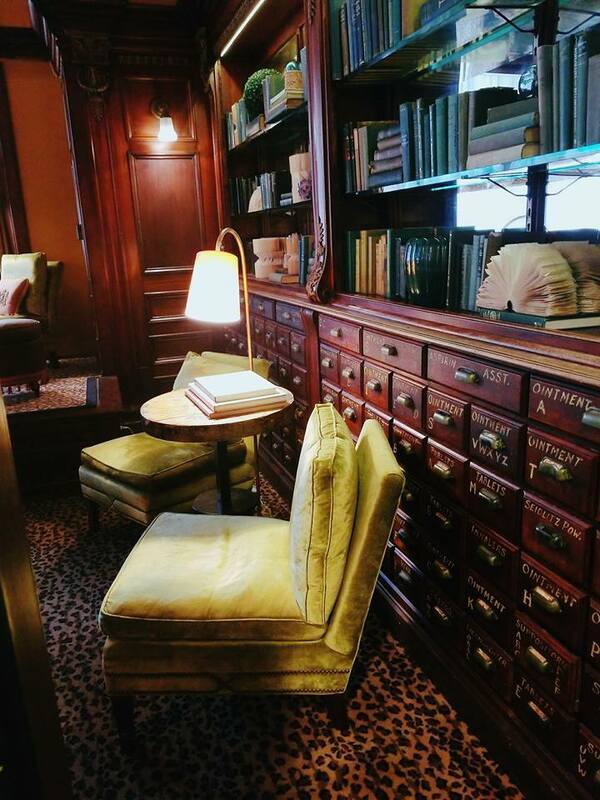 The gorgeous mahogany bookcases and stained glass panels serve as reminders that this space was once a pharmacy. 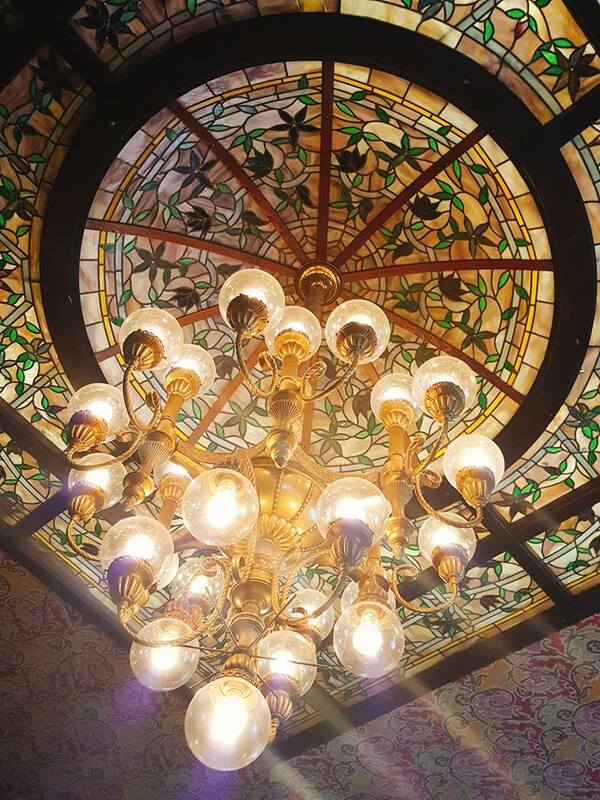 These details delicately retain the history of the building, while transforming it into a lovely and quaint cafe just perfect for a charming brunch. However, Gryphon is so much more than a pretty face. The food is beautifully presented and tastes every bit as good as it looks. The menu offers signature favorites and locally-sourced, fresh, seasonal dishes made with organic ingredients. Gryphon is owned by the Savannah College of Art and Design, and some of the employees are SCAD students. 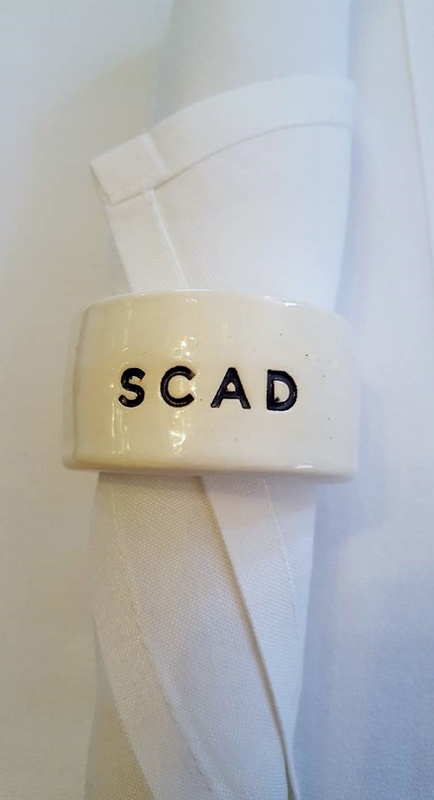 They are doing an exceptional job of carrying on the tradition of Savannah hospitality. 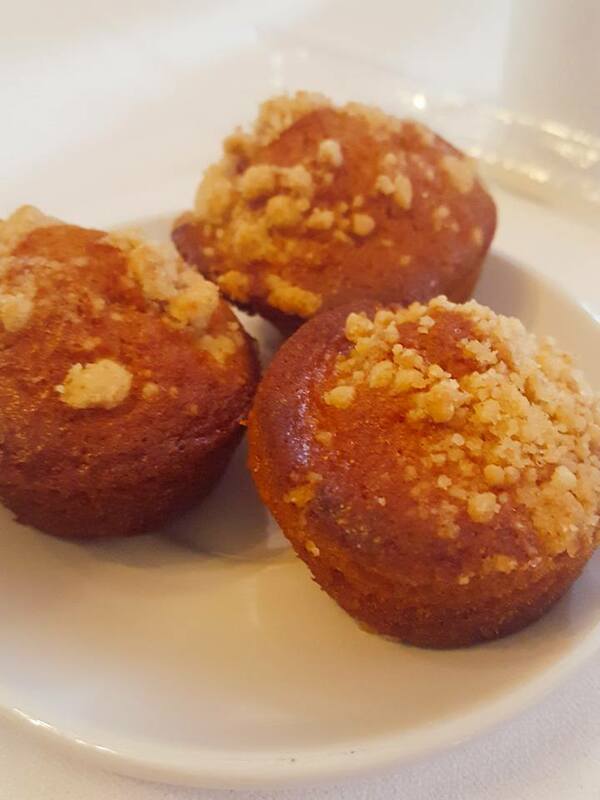 While enjoying your coffee or tea, you won’t be able to resist the little plate of Raspberry Muffins that miraculously appear on your table. This amuse bouche will certainly tickle your tastebuds. Mildly crispy on the outside and moist inside, the muffins deliver an explosion of flavor, thanks to the raspberries. 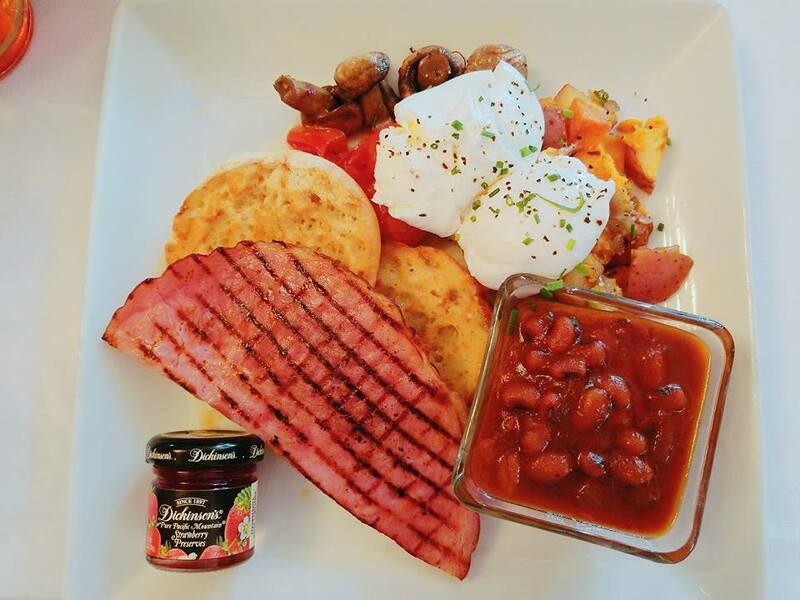 For a fresh twist on some old favorites, try the Full English Breakfast This hearty meal includes poached eggs with English muffin and ham steak. The ham steak wasn’t too salty, but just right and didn’t overpower the meal. It was served with a mix of white and sweet potatoes in a hash with red peppers and onions, and delicately flavored bbq beans with a touch of brown sugar. Yummy! On a visit to the Lowcountry, it would be a shame to miss the fresh seafood. 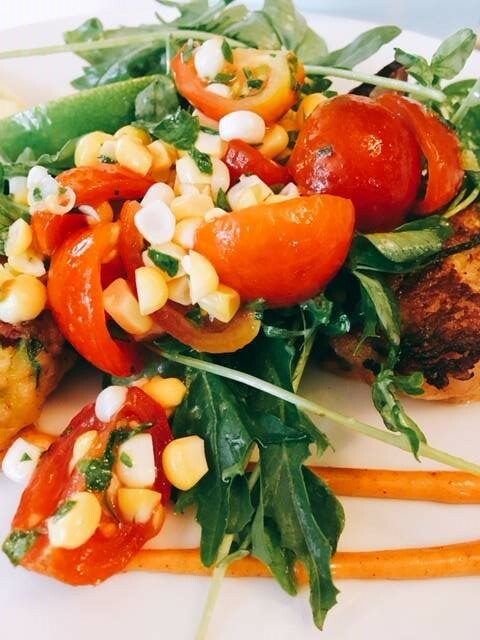 So if you haven’t had your fill yet, order the outstanding Zucchini and Coastal Shrimp Cakes. They’re very similar to crab cakes, but they’re made of very fresh, chopped shrimp instead of crab. These are accompanied by a salad of arugula, cherry tomatoes, fresh corn, avocado and lime juice. This is a meal to remember. Note: the zucchini is so finely shredded that you won’t even know it’s there. 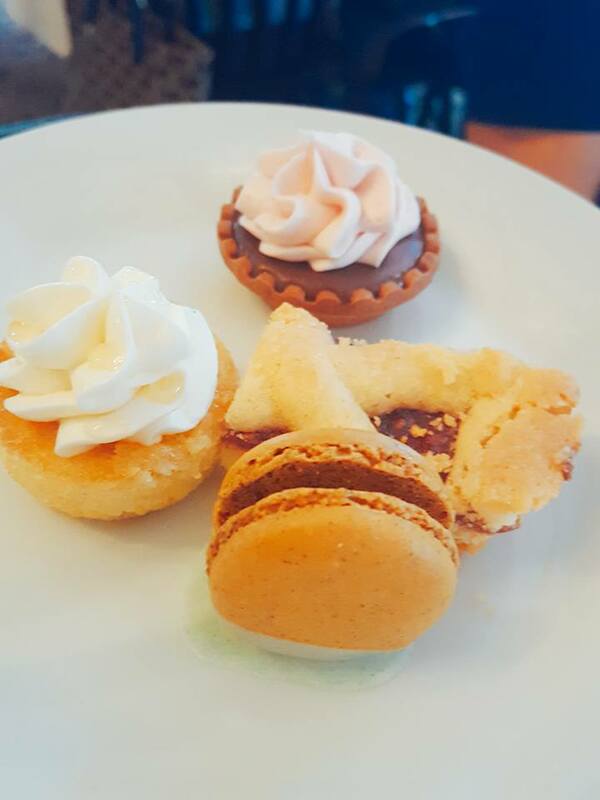 If Afternoon Tea is your idea of luxury, you don’t want to miss this one. Elegantly presented on a tall serving stand, this beautiful assortment of tea sandwiches and treats will make you feel like a member of the royal family. Tasty bites include tiny Chicken Salad sandwiches made of white meat chicken, tarragon and celery. 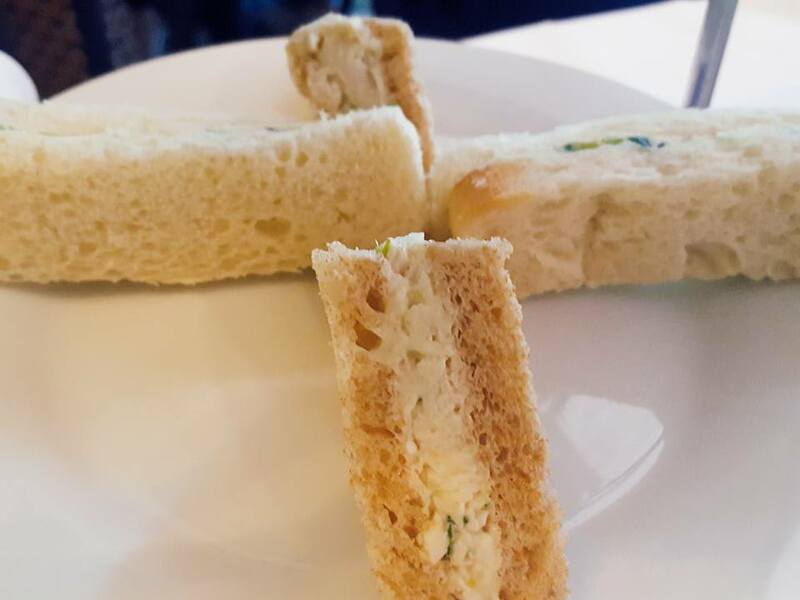 There’s also a refreshing Cucumber Sandwich made of cucumber, dill and cream cheese. The tea cakes are superb. The toughest part will be deciding which one to try first. The mini Sponge Cake is very moist and topped with real whipped cream. The Raspberry Windowpane had the perfect, crumbly texture but the most decadent tidbit is definitely the Chocolate Raspberry Tart, made of raspberry-infused dark chocolate served in a chocolate crust. Wow! 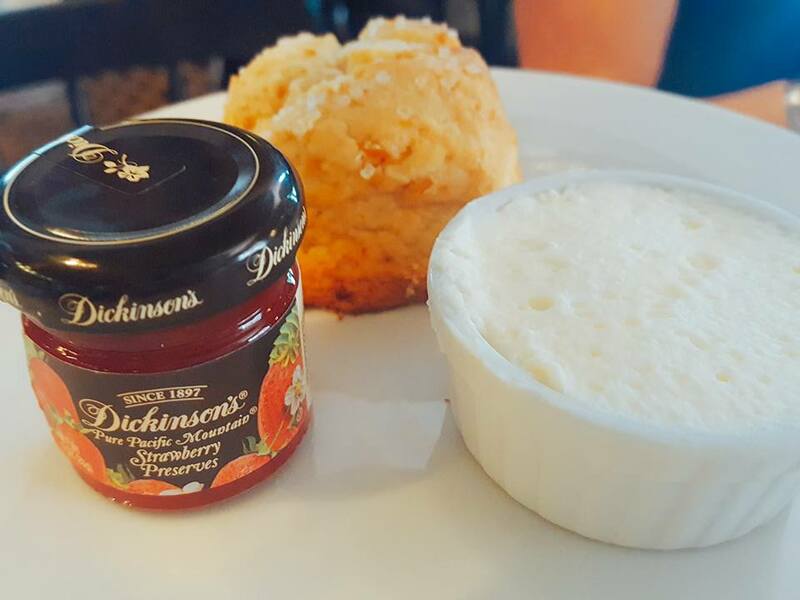 No tea time would be complete without a freshly-baked Scone served with sweetened Devonshire Cream and strawberry jam. It’s truly fit for a queen. Considering everything that’s included, it’s a reasonable price for a royal tradition. Gryphon, 337 Bull Street, Savannah, Georgia. Hours: Monday – Saturday 11 a.m. – 6 p.m.; Sunday 11 a.m. – 3 p.m.
Psssst. 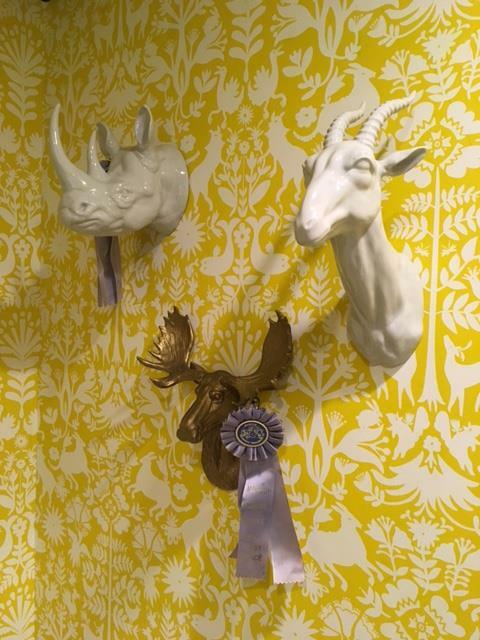 You don’t want to miss the whimsical and clean restrooms. 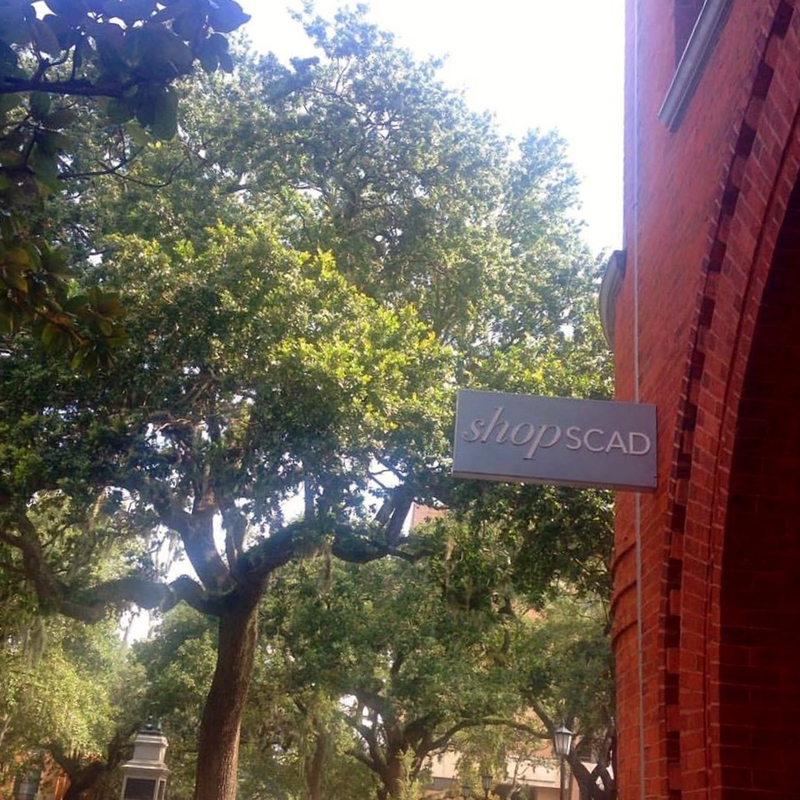 Sadly, our road trip to Savannah is coming to an end, but before you get in the car, walk across the street from Gryphon to the SCAD store. It’s an eclectic display of student artwork in a variety of media and it’s all for sale. Enjoy! 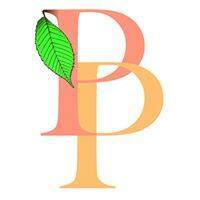 The Peaches are taking a couple of weeks hiatus and we’ll be back with new material in late September! See you next time! Love and Peaches! So true! This is an excellent spot – we’ve had both the high tea and lunch. Always a happy experience!